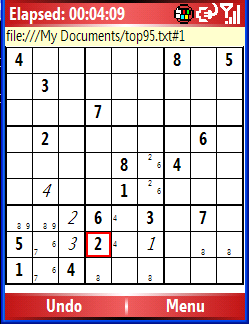 Sudoku is a number puzzle without numbers. This free download is an implementation for Windows Mobile 5 smartphones. Now you can take your favorite puzzle with you at any time! Comes with hundreds of hard to solve puzzles. Download additional puzzles from anywhere. Measures time to solve puzzle. The following screenshot shows a new grid. The following screenshot shows a grid with some numbers entered. 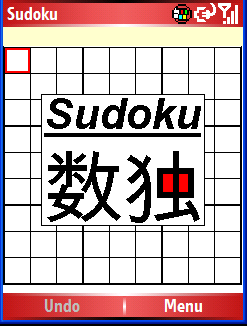 Sudoku for Windows Mobile ships with a number of puzzles in the files top95.txt ans contest.txt. The setup stores these files in your documents folder on the device. You can open the file using Menu/New and then select Menu/Open File. 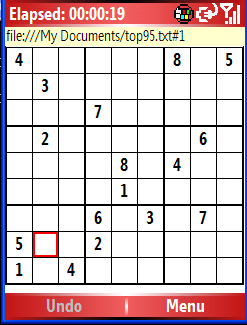 The puzzles come from [http://magictour.free.fr/sudoku.htm]. You can go there and download additional puzzles. You can create your own puzzles files using any text editor. Any lines of text that are either empty or start with a hash character # will be ignored. Any other line contains a puzzle. The contents of every cell are encoded from left to right, line by line. Every character is a cell and contains either a digit or a dot if the cell is empty. The application does not check if the puzzle is valid. You are responsible for defining valid data. You find may resources for puzzle generators or generated puzzles on the net. This software is released under the GNU Public License. You need the .NET Compact Framework 2.0 installed on the device. Download the CAB file, copy it to your device and run it. The source code is also available.